An exploratory study was conducted in Summer 2012 in an effort to determine what librarians in the United States are doing to teach chemistry graduate students research skills. Chemistry librarians at ARL (Association of Research Libraries) institutions were surveyed about the content they teach; when, where, and how they present it; and what assessment they perform. Program size was studied to ascertain its effect on the above. Results reveal the most popular resources and information literacy skills taught, coverage gaps, and preferences for teaching and assessment techniques. Librarians providing instruction to graduate chemistry (and perhaps even upper-level undergraduate) students will find it helpful to compare what they are currently doing against these findings. It is essential that science graduate students acquire information literacy skills, such as the ability to effectively identify, locate, evaluate, synthesize, and use information ethically and legally. In the short term, the typical graduate program requires literature searching and usually the completing of a thesis/dissertation that demands more extensive research skills. In the long term, today's science graduate students who become tomorrow's scientists will be responsible for doing independent laboratory research. They need to build their depth of knowledge to perform efficient literature searches for information specific to their area of research. If they choose a career in academia as future professors, they will be expected to play a role in teaching their students not only laboratory research skills, but literature research skills as well. They should develop enough breadth of knowledge that will enable them to find information outside of their own research area because they will likely be asked to teach a variety of courses. These transferable information literacy skills are also critical for other aspects of life. Science graduate students learn information literacy skills from varied sources. Their faculty advisors may provide them with articles about their research topic (Flaxbart 2001) and highlight the key publications in their field, but this is not the same as teaching the students how to locate and evaluate information themselves. Perhaps some faculty assume graduate students have already learned information-seeking skills at the undergraduate level or expect them to be proactive in learning them on their own, so place a lower priority on teaching such skills. Green (2010) finds that doctoral students prefer to learn independently and often develop information literacy skills in the course of undergoing the literature review process for their dissertation. They are also willing to learn from their peers (Rempel 2010), especially those in their research group (Gardner 2008). Some will consult with librarians, although younger students in the sciences tend to be less convinced a librarian will be able to assist them with their research needs (Macauley & Green 2009). 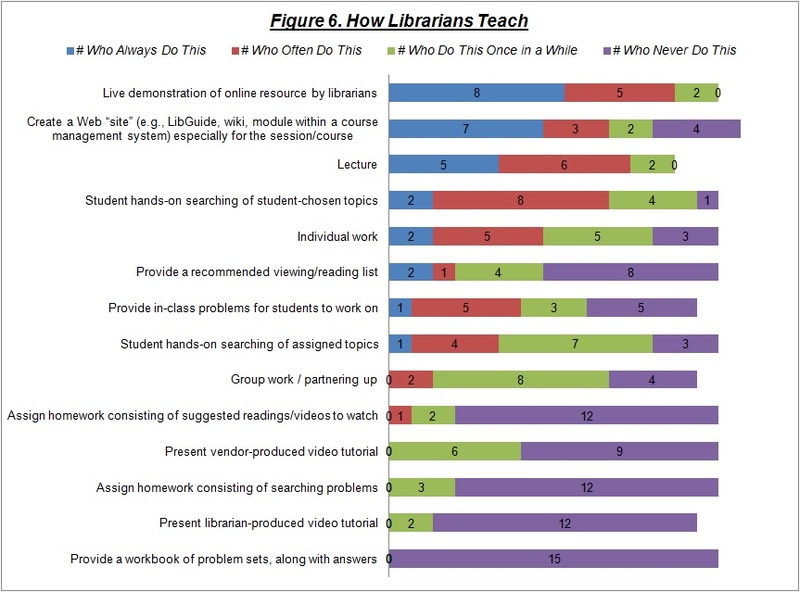 According to Davidson's (2001) study, however, most departments view librarians as integral to teaching students research skills. Teaching information literacy skills to science graduate students is one of the many responsibilities of librarians who serve them, but there is little literature about how librarians currently support them and how they are assessing their efforts. The author saw a need for a comprehensive study that summarizes how librarians teach science graduate students research skills. Recognizing the differences that exists between the research needs of different kinds of scientists (e.g., in geology as compared with biology), the author chose to begin her exploration of this subject with chemistry due to her academic and professional familiarity with the field. She plans to continue examining librarian support for the other science areas if this exploratory study proves useful. This paper explores how librarians in the United States are teaching research skills to chemistry graduate students -- what content is covered; when, where, and how it is presented; what type of assessment is done; and whether the size of a graduate program makes a difference. Although Garritano & Culp (2010) surveyed chemistry department heads in 2005 to determine what resources and information literacy topics undergraduate and graduate students in American Chemical Society approved degree programs were being taught and when they were being taught, they did not look at how topics were taught, how students were assessed, or program size. Their results were heavily centered on undergraduate students, whereas the focus of this study is on graduate students. This study also differs in that chemistry librarians were surveyed. Three recent articles explain how librarians teach chemistry graduate students at their institutions. Currano (2005) provides extensive details about a required graduate-level chemical information course at the University of Pennsylvania, Garritano (2008) discusses optional "Ice Cream Seminars" at Purdue University, and Fong and Hansen (2012) write about a mini-course they designed for a biochemistry research group at Rutgers University. While all discuss content taught and assessment performed, they do not provide a comprehensive report of how librarians across the United States are supporting graduate student research needs. Also, in the eight years since the first of these articles was published, the content covered in chemical information literacy has likely changed. Studying what librarians are teaching today is especially useful given recent trends related to scientific research in academia, such as an increased interest by funding agencies in requiring data management plans and a growing number of colleges and universities with open access mandates or policies. Librarians will benefit by comparing the results from this study with what they are currently doing at their own institutions, identifying gaps or adapting novel teaching approaches. Of special interest might be any recent changes in content coverage due to new trends or resources, assessment techniques used and what differences there might be between what is done with smaller graduate programs as opposed to larger ones. Potentially, these findings will help librarians improve their teaching of research skills to chemistry graduate students, benefiting their students in the immediate term and, ultimately providing society with more information literate chemists and chemistry professors. In this exploratory study, librarians nominally identified as Association of Research Libraries (ARL) "chemistry" librarians were surveyed about how they are teaching chemistry graduate students research skills. ARL institutions were chosen because they are perceived as being more likely to have a chemistry graduate program and a designated chemistry (or physical sciences) librarian to support its research needs. A list of all United States-based ARL institutions was compiled based on information provided on the ARL web site. Chemistry librarians at these institutions were identified and their e-mail addresses recorded according to information found on their library web sites. Each chemistry librarian was sent an individual e-mail in July 2012 inviting him/her to participate in a 20-question online survey. Upon clicking the hyperlink to the survey, potential participants saw the IRB-approved informed consent form, followed by the survey questions. The survey was open for three weeks. Approximately one week prior to the close of the survey period, chemistry librarians were sent a reminder e-mail to fill out the survey. Recognizing that some librarians may not be teaching research skills to chemistry graduate students, both e-mails emphasized that there would be an opportunity to indicate a "not applicable" response on the survey itself and that such an answer is important. The Appendix shows the complete survey, including the informed consent statement. The survey was produced using Google Forms and consisted of two types of questions: select-all-that-apply and open answer. In an attempt to address the limitation of select-all-that-apply questions, the survey was designed to include an option for participants to respond with unanticipated answers. All open answers were coded to be more quantifiable. Chemistry librarians were asked to indicate what online and print resources they taught, what (other) research and information literacy-related topics they taught, and why those topics were chosen. Items listed on the survey were determined to be the most likely possibilities, based on a review of the literature about information literacy instruction in chemistry (Currano 2005; Fong & Hansen 2012; Garritano 2008; Garritano & Culp 2010); the Information Literacy Standards for Science and Engineering/Technology compiled by the ALA/ACRL/STS Task Force on Information Literacy for Science and Technology (2006); and recent trends such as an increased interest in interdisciplinary research, the open access movement, and the management of data. Librarians were asked when they taught chemistry graduate students, if they taught in-person and/or online, and how they taught (e.g., lecture, hands-on experience, in-class problems). Librarians were also asked about the kind of assessment performed. Their answers were then re-examined taking the size of their chemistry graduate programs into account in an effort to identify any possible trends. Twenty-five of the 99 invited librarians participated in the online survey, and while a 25% response rate is acceptable for online surveys, it is not high enough to provide a comprehensive look at the current state of affairs at ARL institutions. However, those who did respond provide important insight into the different ways in which librarians teach chemistry graduate students. Respondents indicate their program sizes range from 25 to 250, with one person skipping this question (see Figure 1). The red "X's" on Figure 1 identify the 32% (8 of 25) of respondents who do not teach chemistry graduate students. There does not seem to be any correlation between program size and whether a chemistry librarian teaches the students research skills or not. It is unclear if the students are receiving instruction from their professors, peers, or trying to learn these skills on their own. This is an area for further research. Unless otherwise noted, the remainder of this article focuses on the 68% (17 of 25) of respondents who do teach chemistry graduate students research skills. Readers may find it helpful to compare survey results against what they are doing at their own institutions, to identify any gaps that may need filling. 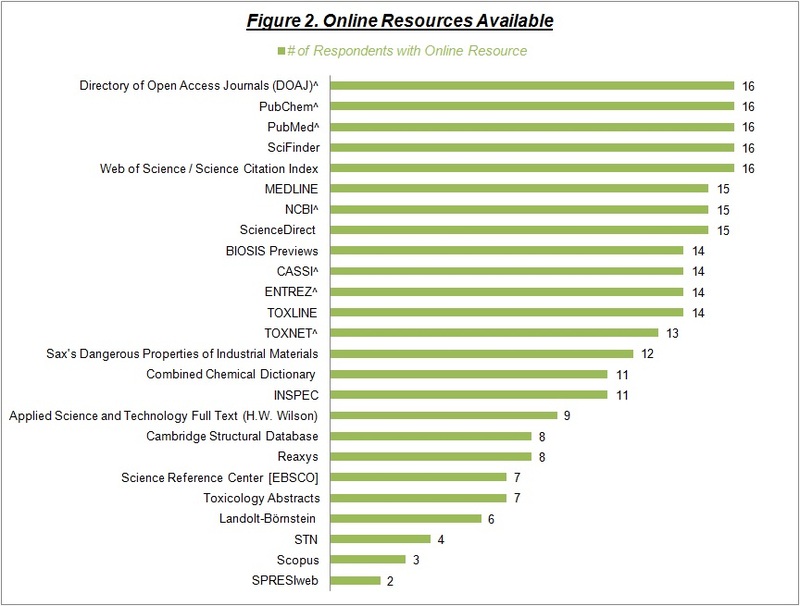 Figure 2 gives an idea of which online resources relevant to chemistry are most prevalent at ARL institutions. Those that are freely available (as indicated with a caret ^), for example, Directory of Open Access Journals (DOAJ), PubChem, PubMed, CASSI, NCBI, ENTREZ, and TOXNET, rise to the top of the chart. Broadly available subscription-based resources include SciFinder, Web of Science, MEDLINE, ScienceDirect, BIOSIS Previews, and TOXLINE. Given the popularity of these resources at ARL institutions, graduate students planning to pursue a post-doc or career in academia should be sure to familiarize themselves with them as it is likely they will encounter them again in the future. For this reason, chemistry librarians should offer training to graduate students interested in learning how to use these resources. Most libraries also provide access to the Combined Chemical Dictionary, INSPEC, Applied Science and Technology Full Text, Cambridge Structural Database, and Reaxys. Although a relatively new resource, it is somewhat surprising that only 50% (8 of 16) offer Reaxys, which replaced the core Crossfire Commander platform for searching the essential resources of Beilstein and Gmelin. Few libraries subscribe to both Web of Science and Scopus. Perhaps due to budgetary considerations, with all choosing the former, few have access to the latter similar product, as well. 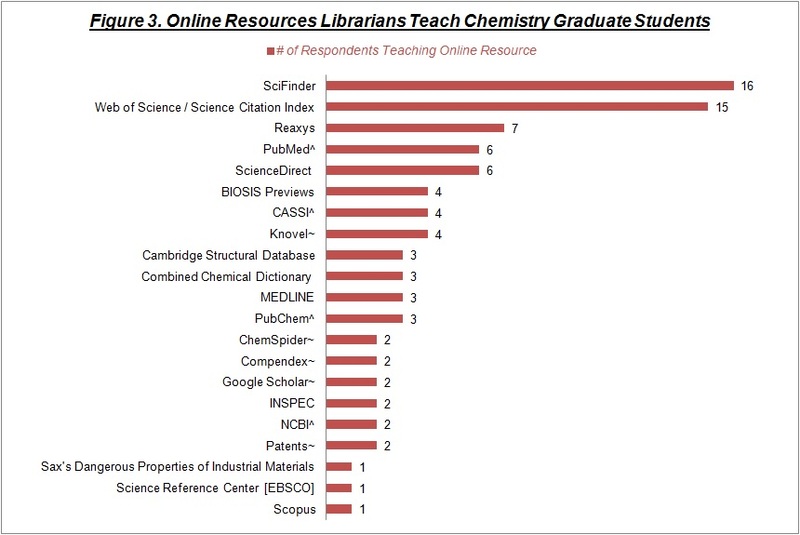 Figure 3 highlights the online resources librarians are most likely to teach chemistry graduate students. Resources from Figure 2 that are not taught have been omitted. Resources mentioned in the open-ended answers have been included and are noted with a tilde (~). 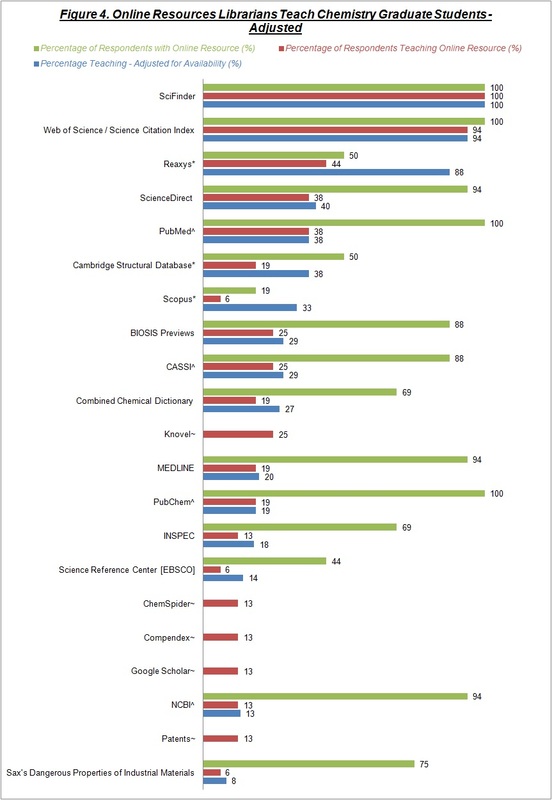 SciFinder and Web of Science, the two resources most subscribed to, are by far the ones most taught. It is interesting to note that TOXLINE, a resource subscribed to by 88% (14 of 16) of respondents, is not taught at all. Perhaps it is not as significant for chemistry graduate student as other resources. Still, there are a lot of other resources chemistry librarians do not teach these students. Sometimes, this is due to the lack of a subscription to a resource. Figure 3 indicates the number of respondents who teach a particular resource without adjusting for availability, but Figure 4 does adjust for availability. The blue bar indicates the percentage of respondents who teach a particular available resource. This is likely more indicative of a resource's relative importance. While there is generally not much difference between the red and blue bars, in a few instances, the difference is significant. These cases are noted with an asterisk (*). Most significantly, when Reaxys is available, it follows closely behind SciFinder and Web of Science in popularity for teaching. These three should therefore be at the top of the list of resources to teach chemistry graduate students to ensure they have the same research skill advantages as students from other institutions. Twenty five percent (4 of 16) of respondents teach print resources. No one resource stands out in importance, but of the various ones mentioned, reference materials such as encyclopedias and handbooks dominate. A few respondents say they teach print resources because electronic equivalents are not yet available. With collection development strategies in the sciences favoring electronic over print materials, perhaps the downward trend in teaching print materials is simply in line with this overall movement. In addition to knowing how to search online resources, there are a number of information literacy skills that could help science graduate students become more successful researchers. 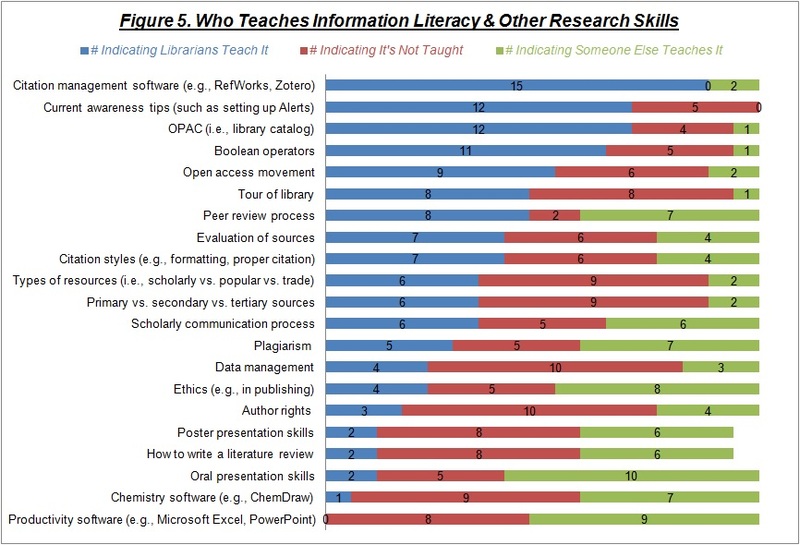 Many of these skills are taught by chemistry librarians or other librarians such as another science librarian, a data librarian, or a scholarly communication librarian. Some skills are taught by science professors, and others may be taught by peers or college/university staff. This study, however, focuses on what chemistry librarians teach. Figure 5 provides a summary of who teaches what. The blue sections indicate the percentage of chemistry librarians teaching certain skills, the green sections show when others are teaching those skills, and the red sections signify the gap where nobody seems to be teaching them. The topics most likely to be taught by chemistry librarians are citation management software such as EndNote, RefWorks, or Zotero (88% or 15 of 17), current awareness tips (71% or 12 of 17), how to use the library catalog (71% or 12 of 17), Boolean operators (65% or 11 of 17), and the open access movement (53% or 9 of 17). It is unlikely that someone else is teaching these to chemistry graduate students, so if they do not learn these skills or concepts from a chemistry librarian, they may not learn them otherwise; therefore, these should also be on the list of topics chemistry librarians teach. Almost half the respondents offer library tours (47% or 8 of 17) and discuss the peer review process (47% or 8 of 17). Whereas library tours for chemistry graduate students tend to be offered only by chemistry librarians, the peer review process is generally covered by someone else (41%) when chemistry librarians do not teach it, resulting in only 12% of chemistry graduate students not learning about it. This was found to be the smallest gap in coverage after citation management software (which had no gap). The largest gaps are seen in the teaching of data management (59% or 10 of 17), author rights (59% or 10 of 17), chemistry software such as ChemDraw (53% or 9 of 17), and distinguishing between types of resources (53% or 9 of 17). In other words, it seems only 41% -- 47% of chemistry graduate students are being taught these topics. Further research is necessary to determine why these topics are not taught by chemistry librarians or someone else. With chemistry software primarily taught by someone else (41% or 7 of 17), it may likely be perceived as something outside the purview of librarianship. Thirty five percent (6 of 17) of chemistry librarians do teach about types of resources, so the gap there might be due to assumptions about graduate students' prior knowledge. Since data management and author rights are newer "hot" topics, perhaps a general lack of expertise in those areas is the reason for the lack of coverage. If so, there is great potential for librarians to address those gaps. Chemistry librarians may wish to seek training that enables them to teach data management and author rights. Or, if available, they might consider inviting a data librarian (Fong & Hansen 2012) and scholarly communication librarian to teach them. After all, while 35% (6 of 17) of chemistry graduate students learn about the scholarly communication process from a chemistry librarian, the same number learn about it from someone else -- quite possibly a scholarly communications librarian. There are a number of skills chemistry graduate students are more likely to learn from someone other than a chemistry librarian. This is especially true in the case of oral presentation skills (59% of 10 of 17) and how to use productivity software such as Microsoft Office (51% or 9 of 17). Rather than duplicate efforts, the chemistry librarian may want to instead spend his/her teaching time focusing on other topics. Ethics and plagiarism are taught by someone else at 47% (8 of 17) and 41% (7 of 17) of institutions, with chemistry librarians teaching them only at 24% (4 of 17) and 29% (5 of 17) of institutions, respectively. Neither are taught at 29% (5 of 17) of institutions. Is this a gap chemistry librarians should seek to fill? Or are there other topics considered more appropriate for them to teach? How to write a literature review and poster presentation skills are both taught by someone else at 35% (6 of 17) of institutions, with chemistry librarians teaching them at only 12% (2 of 17) of institutions, but this still results in a gap where almost half (47% or 8 of 17) of chemistry graduate students are not taught these important skills. Whose responsibility is it to close this gap? These skills are included as part of the ALA/ACRL/STS Task Force on Information Literacy for Science and Technology (2006), so it may be suitable for a librarian to address. They may also be part of the university-wide learning outcomes, departmental program goals, and/or class learning objectives, though, which makes them the ultimate responsibility of professors. There are numerous occasions where chemistry librarians might teach chemistry graduate students research skills. Most respondents teach them sometime during their first year of study (69% or 11 of 16), primarily at orientation (63% or 10 of 16). They also reach them at various points of need throughout their graduate career. Since first-year students have very different needs from those in later years, respondents suggest offering general information about the library at orientation or sometime during the first year of study, and providing more specific individual consultations in later years. Rempel (2010) stresses the importance of timing, emphasizing that the first year is best for establishing contact with graduate students, but the teaching of specific skills is more effective at point of need, when the student is ready to apply that skill to their own research. Most of the opportunities chemistry librarians have to teach the students come in the form of either one-shot sessions (75% or 12 of 16) requested by professors or student groups, workshops offered (75% or 12 of 16), or one-on-one research appointments. Only a small number (19% or 3 of 16) are invited to teach two or more sessions within a regular course or seminar series. Perhaps they serve as embedded librarians. The same percentage of respondents reach out to students through their faculty advisor's research groups (19% or 3 of 16). This may be a possibility to explore for those librarians looking for alternate channels to reach more graduate students. Fong and Hansen (2012) recommend using this particular method for interdisciplinary research groups who may want exposure to resources not traditionally used in their primary department. Other nontraditional venues that respondents use include a journal club, thesis camp, and workshop series offered by the writing center. Collaborating with another university unit or student organizations should be considered to increase the visibility of the library and to help promote its services. Survey responses show an uneven exposure of students to the research skills necessary for them to become successful scientists. These skills are not prioritized at the same level by different chemistry departments across the United States. While 44% (7 of 16) of chemistry librarians teach research skills within courses, a seminar series, or workshop series dedicated to chemical information literacy or chemical literature, others do so within venues that are more general. And although a little more than half (56% or 9 of 16) of respondents teach these skills in sessions that are required of the students, 38% (6 of 16) are only able to offer them during optional sessions. How can departments ensure their students will remain competitive with peers in other programs? If integrating literature research skills into the curriculum is not possible and requiring them as part of a separate graduation requirement is not an option, perhaps they could strongly encourage students to attend the optional sessions. Along the same lines, when promoting these sessions, librarians might emphasize how they will provide students with skills that are on par with those in other graduate programs where information literacy skills are taught in required courses. Survey results reveal that just about all teaching occurs in person. Although online courses and programs are increasing in number, none of the respondents teach online in a synchronous manner. It is unclear how many teach online asynchronously. Approximately 10% (2 of 17) of respondents indicate they teach in another format, but they do not specify if it was through interactive online tutorials, hybrid environments, or something else. Libraries are adopting technology quickly, so this is an area to pay close attention to. Figure 6 summarizes the methods chemistry librarians use most to teach graduate students. The blue sections indicate what is always done, the red sections show what is often done, the green sections signify what is done once in a while, and the purple sections note what is never done. Live demonstrations and lectures are typical, with almost half of librarians always creating a web site customized to the session or course they are teaching (such as a LibGuide, wiki, or module within a course management system). Librarians also value interactive learning. The majority of respondents often give students time for hands-on experience searching for information about their own research topics. Less often, students are asked to do hands-on searching of assigned topics or are provided with in-class problems to work on. This is useful when students do not have a topic to research yet because it offers them an opportunity for more structured practice while a librarian is available to answer questions. While doing individual work is much more likely, over half of respondents do have students work in groups every once in a while. And since chemistry graduate students typically work in a research group, the opportunity to do group work might help them develop their teamwork skills. It might also provide them with a chance to work with students outside their research group, to meet potential future collaborators, and perhaps build a greater sense of community among graduate students within a department, something Goldenberg-Hart (2008) found to be of interest to NYU graduate students. Some respondents present vendor-produced video tutorials every once in a while during research instruction sessions, but they are much less likely to present librarian-produced ones. It is unclear if this is due to availability or quality. Of course, video tutorials may not make the most sense for in-person sessions where live demonstrations can be done, but the videos could be highly useful for online courses and asynchronous point-of-need learning. They should be highlighted as supplementary materials to a session, especially when time is limited. In fact, some librarians already provide students with recommended viewing or reading lists and a few even assign homework that consists of suggested readings or videos to watch. A few librarians also assign homework consisting of searching problems, although none offer a workbook of problem sets with answers. Since most librarians teach one-shot sessions, assigning homework may be difficult, but if faculty are interested in homework that requires more practicing of information literacy skills, technology may make it possible to easily grade such homework. For students attending optional sessions, a workbook of problem sets with answers may be preferred. That way, students could work on them at their own pace and would have something to reference at their point-of-need. One obstacle to providing this supplementary material, however, would be the time and effort it would take for a librarian to put it together and keep it relevant. Working collaboratively on such a project where materials are shared freely would help tremendously. XCITR (eXplore Chemical Information Teaching Resources) (n.d.) is one instance of such a project. As more emphasis is placed on assessment and calculating return on investment (ROI), it is important to know how science librarians are assessing their instruction. Survey participants were asked when students are assessed: pre-session, post-session, both pre- and post-session, or not at all. They were also asked how students are assessed. More than half of chemistry librarians performed some kind of assessment. Tables 1 and 2 illustrate the similarities and differences between the assessment respondents carry out when teaching sessions about online resources as compared with sessions about information literacy and other research skills. Regardless of what is being taught, chemistry librarians rarely perform both pre- and post-session assessments. This makes it difficult to measure a librarian's instructional effectiveness. Similarly, although they are likely to ask students to self-assess (e.g., rate their own confidence level when using a resource or performing a task) or to evaluate a library instruction session (e.g., write a reflective one-minute paper or offer suggestions for library session improvement), these assessment methods are not true indicators of whether a student has learned something or not; instead, either general or specific content knowledge (i.e., the demonstration of a specific application of knowledge) must be assessed. When online resources are taught, librarians are slightly more likely to assess a student's general content knowledge (such as identifying which online resource to use to find properties information) than their specific content knowledge (such as determining the melting point of a substance given its chemical structure). When information literacy and other research skills are taught, however, librarians are much more likely to assess students' general content knowledge (such as explaining what plagiarism is) than their specific content knowledge (such as a writing a short essay synthesizing at least two articles and providing proper citations). Perhaps time constraints result in a librarian's tendency to perform one type of assessment over another. Further research into this is necessary given the prominent role assessment plays in higher education today. Much time and effort is needed in order to assess content knowledge. One must build instructional rubrics and find or design suitable assessment tools, allot time during instruction sessions to assess students, then set aside time afterwards to analyze assessment results -- not to mention the effort involved to improve future instruction sessions. Working collaboratively with librarian colleagues to develop or share assessment tools might be a solution to help everyone save time and avoid duplication of efforts. Creativity may be needed to find time to assess students. Using a classroom response system such as iclickers would not only integrate assessment throughout an instruction session, but the interactivity could also increase student engagement. A flipped classroom situation would result in an opportunity for graded in-class exercises. Replacing a one-minute evaluation paper with five to ten carefully crafted multiple choice questions testing content knowledge instead would also allow librarians to determine if a student really has met a certain competency level for a specific skill -- and would actually be easier to grade than open-ended one-minute essays. 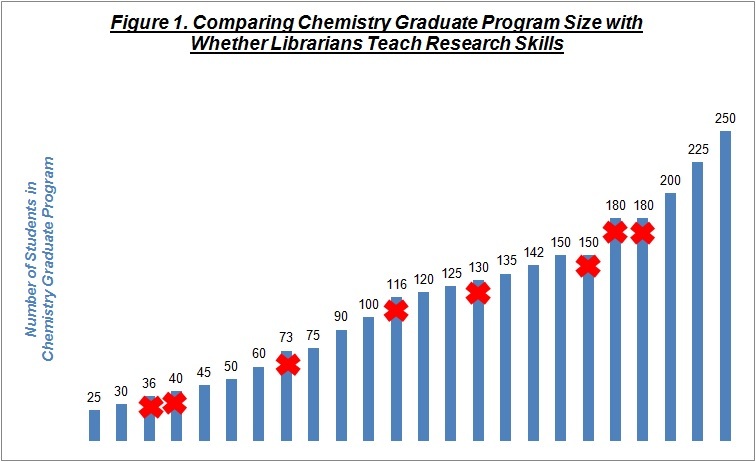 Although the size of a chemistry graduate program generally does not seem to make a difference in how librarians teach the graduate students in them, there are several instances where size does seem to matter. For example, only the chemistry librarians working with the largest programs taught oral presentation and poster presentation skills. Larger chemistry graduate programs (with greater than 75 students) involve librarians in their new chemistry graduate student orientation, and a librarian for one of the largest programs teaches a required course dedicated to chemical information literature. Perhaps the number of students in the larger programs is necessary to make such a course feasible to run. In smaller programs (fewer than 90 students), chemistry librarians are likely to teach a separate required seminar/workshop series dedicated to chemical information literacy. Or they integrate multiple library instruction sessions either within a regular course or series of seminars/workshops not dedicated to chemical information literacy. Methods utilized in the classroom typically are not affected by program size. While librarians working with most graduate programs perform assessment, those who support smaller programs are more likely to do so than those supporting larger programs. It is unclear if the large number of students is a deterrent because there would be too many students to assess, or if there is another reason those librarians tend not to assess. It seems smaller and larger programs each have their advantages and disadvantages for chemistry librarians. This exploratory study offers chemistry librarians a glimpse into how some of their colleagues at ARL institutions are meeting the instructional needs of graduate students. Librarians at both ARL and non-ARL institutions who provide instruction to chemistry students at the graduate and upper-undergraduate level may find survey results to be of particular interest for the purpose of self-comparison. They may re-think their allocation of funds for chemistry resources, identify new venues for pursing instruction, discover ideas for improving instruction, and/or modify their assessment methods. Other science librarians and non-science librarians might also find certain aspects of this study useful. While some of the findings from this study are not surprising, there are a few interesting things to note. For example, only approximately two-thirds of respondents indicate they teach chemistry graduate students and there is no correlation here with program size. Program size does, however, affect whether assessment is performed, with less being done in larger programs. Given the growing importance of assessment, it would be worthwhile to explore methods of assessment that are less time-consuming to disseminate and grade. This would be beneficial for all librarians, regardless of program size. Much of the content that chemistry librarians teach are traditional topics, but they should consider including new topics to their list -- ones that are important for graduate students to learn, but do not seem to be taught by anyone. This includes data management, author rights, how to write a literature review, oral presentation, and poster presentation skills. Although almost all chemistry librarians teach SciFinder, Web of Science, and Reaxys (when it is available), they should also think about teaching freely available resources students are sure to have access to after graduation. Granted, the limited amount of time librarians have for library instruction likely prevents them from covering all that they wish to. Further research could identify additional opportunities for students to learn information literacy and other research skills, whether through a self-paced online learning experience online or taught by someone other than a librarian. Research should also be performed to determine if certain methods are better than others for learning specific skills. As online programs increase, it is useful to learn how our colleagues approach their responsibility of supporting online students. While there is little indication from survey results that this is being done, revisiting this issue in a few years will likely produce much more data. Although there are certainly some information literacy skills that will remain timeless, the methods librarians utilize to teach them will need to be adjusted to fit the changing world. The list of topics to teach will also require fine-tuning as scholarly communication changes and resources are modified. Similar to our expectations that students will continue to use their information literacy skills for lifelong learning, so too should librarians continue to gather information, evaluate it, synthesize it, then use it to inform their decisions about educating the next generation. Davidson, J.R. 2001. Faculty and student attitudes toward credit courses for library skills. College & Research Libraries 62(2):155-163. Macauley, P. & Green, R. 2009. Can our relationships be reconceptualized? Librarians, information literacy, and doctoral learners. Journal of Education for Library and Information Science 50(2):68-78. Rempel, H.G. 2010. A longitudinal assessment of graduate student research behavior and the impact of attending a library literature review workshop. College & Research Libraries 71(6):532-547.